The list of your free Xbox games for August has been revealed. Microsoft has announced the games Xbox Live Gold members will get for free during the month of August on Xbox One and Xbox 360. As always, there are four in total, two on each platform. On Xbox One, Warriors Orochi 3: Ultimate will be free during the whole month. WWE 2K16 will join from August 16 and until September 15. 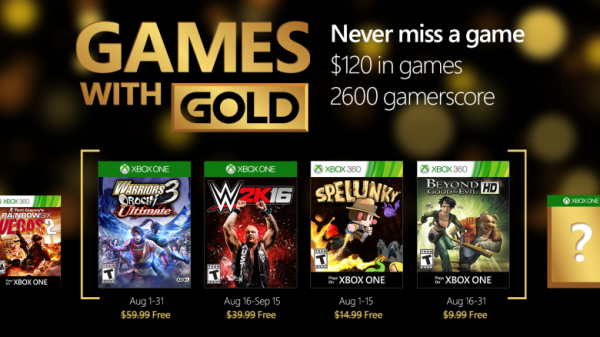 On Xbox 360, Spelunky starts things off on August 1 and through August 15. Beyond Good & Evil HD takes over August 16 and remains available until August 31. Remember, you still have time to pick up some of July’s games if you haven’t. Tumblestone will still be accessible until August 15 on Xbox One.